Being an avid follower of Canadian youth soccer development, being a part of running my own girls soccer development in Connecticut and being an overall soccer junkie, I love investigating and learning how different countries develop players. It’s one of the reasons that I love traveling and playing in different countries so much. There is no better way to learn than being at ground zero. There is also a ton of talk in Canada about the need for a “national curriculum.” It kind of reminds me of a class I took at the University of Connecticut called Organizational Learning. How do you take information and get an entire organization to understand and implement it. But let’s get back on the field. When I first got here, I trained with Sydney FC. The coach was setting us up for a drill when he started throwing numbers around. I started panicking on the inside, as everyone jogged into their positions familiar with the language. Being the genius that I am I quickly figured out that the numbers meant positions, but I knew the position I played and number I wore for Ireland was the 3 and a left back, and the 3 in this situation was clearly moving into one of the central positions. I did what I do best and played it cool, while hoping to God that there wasn’t going to be a test at the end of practice. In the end after having the opportunity to sign with Sydney, for reasons that made sense off the field, I came up to Newcastle. By the time I got here, I was comfortable with the language. 3 and 4 were the center backs, 2 was the left back, while 5 was the right back. The 6 sat in the hole as the defensive center mid. the 8 and the 10 played in the middle while 7 and 11 attacked the wings. The 9 was up top. Tactically it was very clear the responsibilities of all the numbers, and with a team stacked with teenagers, I marveled at how everyone was on the same page with what their responsibilities were on the field and what they were supposed to do. 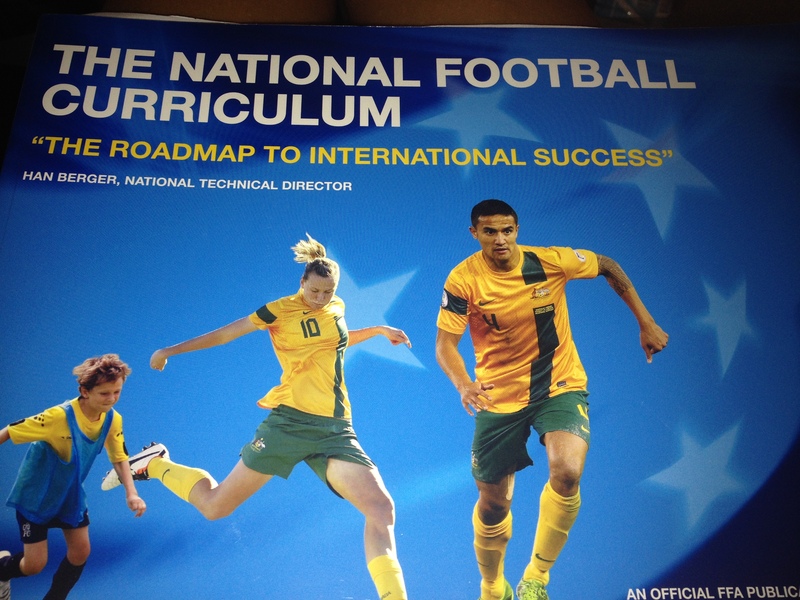 I would get into casual conversations with my teammates and coaches and they always referred to the “national curriculum.” Like some sort of far away holy bible that everyone in Australia had had a glimpse of and knew about. It seemed to be everywhere. Watching a men’s A League game on TV, the commentators were also using the numbers of the players, and framing their critiques of players around the responsibilities of each numbered position. I was impressed at the buy-in and the pervasiveness of the information. In our pre-game last weekend our coach wrote on the board “BP” and “BPO” with points under it. One of the players on my team asked what he meant. “Ball Possession” and “Ball Possession Opponent” he replied. “Why didn’t you just say ‘Defending, Attacking'” she asked him. “National curriculum language” he replied. And that ended that. So imagine my excitement when my roommate, who coaches soccer at a local high school, was doing some work at the living room table and I caught a glimpse of it, a glossy 292 page book, “National Football Curriculum: The Road to International Success.” by Hans Berger, National Technical Director. Going through the booklet it is clearly outlined the different building blocks and phases for every age group both technically and tactically. 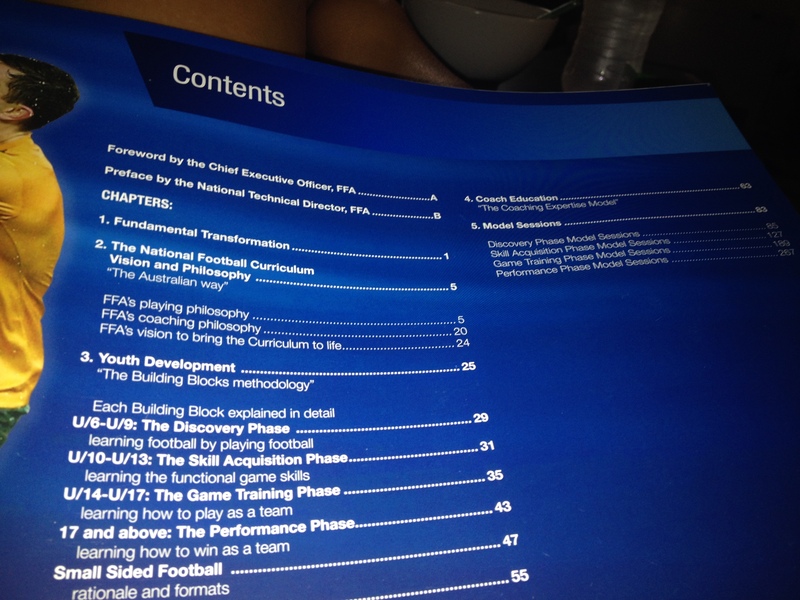 There is the FFA playing philosophy, their coaching philosophy, their vision on how to bring the theory to life. It is a fascinating to go through to see how another country interprets the game, and a document that all of the coaches refer to, and utilize uniformly as they train players of both genders, all ages and levels. Some people argue here that the national curriculum here stifles creative development of players and doesn’t make players think. They say that now players don’t think as they are taught one way to play. They argue that soccer is a game that’s beauty lies in being interpreted and played in many different ways. For me, let’s just say, all that you need to know about my development as a youth, that as a 12 year old I still toe punted the ball, and I realize every day that it is a sheer miracle, founded purely on hard work and a desire to learn and better myself that I’m 34 years old and still playing at the highest level. I think having a structure and a clear pathway with objectives to meet is extremely important. Having coaches in a country speaking the same “language” and teaching utilizing the same book, allows players continuity as they learn and develop within the game. I think once the players have that solid technical and tactical foundation, then you begin layering, showing players that this is just one way to think, and exposing them to the worldwide game where there are so many different ways to layer upon things, building your own identity as a player. From all the countries I have spent a significant amount of time in as a player, including Canada, the US, Ireland, Norway and Denmark, Australia is the first that I have been exposed to such a clear and uniform methodology of teaching the game, and it is one that I think is invaluable for player development.